The James Pappoutsakis Flute Competition will commemorate its namesake, the longtime Boston Symphony flutist and noted teacher who died in 1979. In honor of the eminent Boston flutist Fenwick Smith, this year’s laureate, Thomas J. Wible, the 33rd in the competition’s history, will offer a recital in Jordan Hall on Sunday, September 8 . For three decades Smith’s annual early September Jordan Hall recital, with an always changing group of collaborators, unofficially marked the beginning of Boston’s concert season. 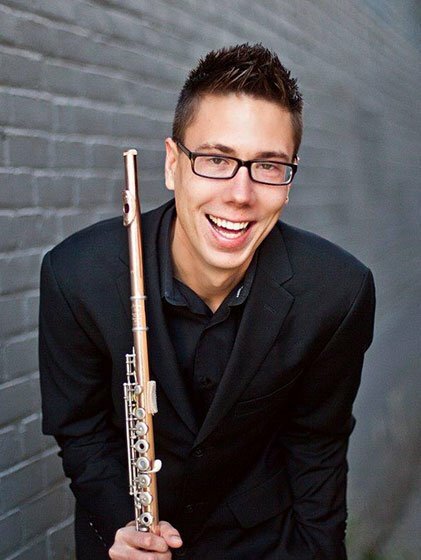 This year his friends and colleagues will return the honor with pre-concert remarks and performances before the tradition of the September flute recital is handed off to the current and future winners of the Pappoutsakis Competition. Wible, a recent graduate of Boston University, is now beginning a Master of Music degree at the Longy School of Music of Bard College. His recital with pianist Ayoko Yoda and harpist Franziska Huhn will include Jean Marie Leclair’s Sonata in E Minor, Suite for Flute and Piano by Charles Marie-Widor, MIT professor Peter Child’s Dialogue for Solo Flute, and NEC professor John Heiss’s Serenade for Flute and Harp. 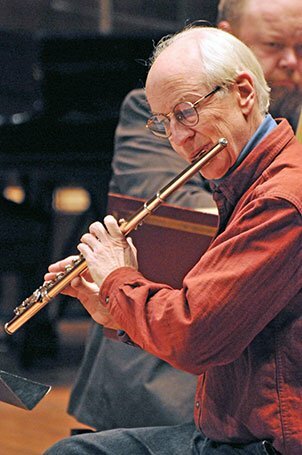 Fenwick Smith joined the Boston Symphony as second flutist in 1978, playing his final concert as a member of the Orchestra on August 27, 2006. During that time, he spent five years as acting assistant principal flute of the BSO and first flute of the Boston Pops Orchestra. After his retirement from the BSO, Smith took an expanded teaching commitment at New England Conservatory until his retirement in 2012, after three decades at NEC. Smith was a member of the Boston Chamber Music Society from 1984 to 2011; performed on baroque flute with leading early-music ensembles; and for 13 years was a member of the contemporary-music ensemble Boston Musica Viva. He performed for 15 years in the Mélisande Trio with violist Burton Fine and harpist Susan Miron, appearing at Wigmore Hall London, Merkin Concert Hall and other venues. His annual Jordan Hall recitals, performed for 35 years, became a prominent feature of Boston’s concert calendar. As a concerto soloist, Smith introduced Boston audiences to works by Lukas Foss, John Harbison and Christopher Rouse. His discography includes premiere recordings of works by Copland, Foote, Gaubert, Ginastera, Koechlin, Dahl, Schulhoff, Schoenberg, Harbison, Cage, Pinkham, Rorem, and Reinecke. He has recorded for Nonesuch, Hyperion, Koch, and Naxos. A 2001 recipient of NEC’s Laurence Lesser Award for Excellence in Teaching, Smith taught master classes in China, Japan, Europe, and across the United States.